My throat is tight, my heart beats faster, my hands suddenly become sweaty as my finger hit the play button. The new Blind Guardian has arrived !!! At the end of the first play, I immediately realize that many spins will be required to find the key of the new Bards world. Today, after many spins, I can tell you that this new Blind Guardian album .... is their best ever effort as A Night At The Opera will stay in the history of metal forever. I don't know how many messages I will receive for that, but I am not a huge fan of their previous work (Nightfall In Middle-Earth) and this is the main reason why I refused to write a review on it. I am a Blind Guardian's fan almost since their beginning and I considered Imaginations From The Other Side & Tales From The Twilight World as their best albums ... until this one of course. Yes I found Nightfall In Middle-Earth too progressive, too "commercial" and less heavy compare to all their previous records. Welcome To Dying, The Last Candle, Lost In The Twilight Hall, Imaginations From The Other Side or Bright Eyes (all songs) seem so far and only Mirror, Mirror was saving the previous record. Today I admit that without Nightfall In Middle-Earth, A Night At The Opera would never have seen the light and I found myself finally "understanding better" Nightfall In Middle-Earth. It was a step, a natural step, a necessary step that was opening the door to this magnificent, this jewel, this masterpiece, this killer, this never-done-before, this "you-can-throw-away-all-your-other-metal-cds" called A Night At The Opera. What the hell can I say about Precious Jerusalem (1st track), Battlefield (2th track) or The Soulforged (7th track) ? 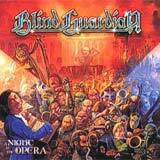 I could say that previous Blind Guardian's chorus were miserable. 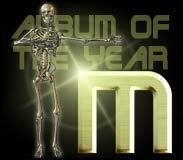 What the hell can I say about The Maiden And The Minstrel Knight (5th track) or Punishment Divine (9th track) ? I could say that the orchestration of Nightfall In Middle-Earth or Imaginations From The Other Side are "rocky-games" compare to what you will have the chance to hear very soon. Under The Ice (3rd Track) is a classic amongst the classics and Sadly Sings Destiny (4th track) sees Blind Guardian trying new things, new elements ... and totally succeeding on this new path. And I am forgetting Wait For An Answer (6th track) which is impossible ... to describe, you have to discover it by your own. I warned you with the single And Then There Was Silence, Blind Guardian is unpredictable and believe me this song has nothing to do with the full album, absolutely nothing. If you like And Then There Was Silence (being fantastic of course), I can't find the right words I should use to describe you the remaining 9 songs, as such arrangement and orchestration have never been made (heard) before. As I am listening to the cd for the hundred times while writing this review, I still discover here and there unbelievable structures and melodies ... and I am wondering if I was deaf when I listen to it ... just an hour ago. And it grows, it grows, it grows inside you like an alien. Well in other words, the kind of CD you bring with you on a lost island. Blind Guardian ... who said 'Metal Guardian' ? These guys will explode Wacken 2002 ... and I will miss that for nothing.